Singing Coach vs Voice Teacher: What's the Difference? For a long time there has been a debate within the music community about the difference between the terms “singing coach” and “voice teacher“. The debate is centered around the use of the word “coach”, versus “teacher”. People use both these terms to refer to professionals who help singers, but the question remains the same. What’s the difference between a “vocal coach” and a “singing teacher” when it comes to singing? To the general public, the terms “singing coach” and “singing teacher” are often thought to be synonymous. However, the difference lies within the use of the verb “coach” rather than “teach“. Generally speaking, a singing coach is someone who “coaches” singing while a voice teacher “teaches” singing. If this difference seems small and confusing, you’re not alone. There are also lots of teachers who use the term “vocal coach” and “voice teacher” interchangeably. While there are some who do both, there are a few basic differences between a coach and a teacher we should discuss. The term “voice teacher” is most often used to refer to a teacher that has been educated in and instructs vocal pedagogy. Voice teachers teach the technique of singing. The singing teacher is one who is able to guide a student, from a beginner to a seasoned pro, toward better singing. It doesn’t matter what level the student is at, good vocal technique and a healthy singing voice is the goal. There are many different vocal techniques dedicated to creating beautiful voices. And teachers may be educated at a university, or posses a voice teacher certification. However, it is the voice teacher’s ability to develop the singing voice that distinguishes them from the “vocal coach”. Like the name suggests, a “singing coach” is a professional whose job is to “coach” a singer’s voice. Often, the term “vocal coach” is a blanket term used by anyone who improves the performance of their student. A vocal coach’s job is to improve the performance. While a vocal coach may also use the title “voice teacher”, they may not possess the same level of education. It would be odd, as an example, for a music professor at a university to call themselves a “vocal coach”, even if they teach private lessons. A vocal coach’s job rests on the assumption that a student is already able to sing well and just needs coaching in order to achieve a goal. Some students who seek a vocal coach may be preparing for an audition or are studying a character for a performance. So while a voice teacher is able to instruct a student of any level, the singing coach must meet the student where they’re at and work primarily on improving the performance of a singer. In addition to coaching a performance, a vocal coach may also focus on stage movement, “acting” a song, honing vocal style or many other subjects related to the voice. But they may not teach singing. In the music industry, singing coaches and voice teachers perform many of the same functions and may even be performed by the same person. After all, both professionals’ jobs are designed to improve the singer to achieve a goal. At Ramsey Voice Studio, I rely on my education as a voice teacher to develop the singing voices of my students. However, there are times I will also “coach” my students when they are preparing for a performance. Of course, perfect vocal technique never survives impact with performance, so it’s incredibly important to be able to switch to the role of a vocal coach when needed. Many voice teachers are versatile enough to do both jobs. A “singing coach”, on the other hand, may lack the foundation of singing technique necessary to help their students become better singers. But once the student’s voice has developed enough, a singing coach is absolutely essential for a serious performer. 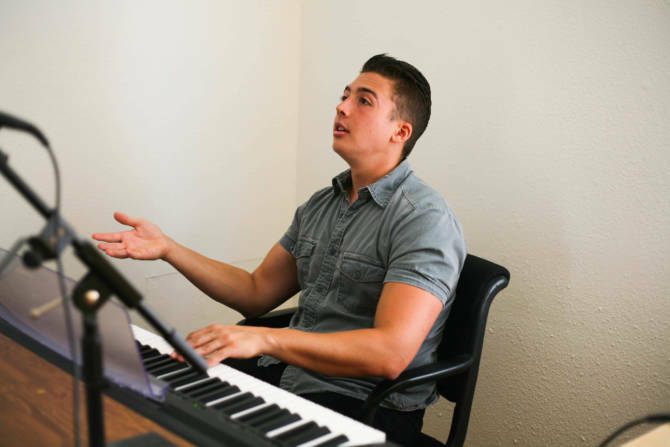 While the terms may be used interchangeably, the difference between a singing coach and a voice teacher is that a voice teacher can “teach” singing. Whereas a singing coach can only “coach” someone who already sings. If you’re a serious performer, it’s important that you find a professional who is able to wear both hats. Both vocal technique and coaching are essential for a singer. However good vocal technique should be the foundation. Even if you already have a good voice, a qualified voice teacher will help you further develop your voice. And a vocal coach will ensure you’re ready to perform. To begin vocal training or prepare for an upcoming performance, check out my complete singing program Master Your Voice or book a voice lesson.